Perhaps no other statement suggests the rivalry shared by Mozart and Salieri better than this one as written by Carrie Fisher “Resentment is like drinking poison and waiting for the other person to die.” Indeed, Salieri did not take respite from his devilish plans to sabotage Mozart and his career and got peace, supposedly, only when Mozart dead at a tender age of 35 was buried in the mass grave, a pauper's grave rather - an unmarked grave....come to think of it, it's so shocking that the genius and the child prodigy we have grown up admiring died like a pauper and buried with no respect. The greatest musician of all time met such a shocking fate because his rival Salieri taking full advantage of his position and power exploited every means possible to stop Mozart from rising above. I was watching the movie "Amadeus" last night and towards the end, I got so overwhelmed by the depiction of Salieri plotting and sending Mozart to his grave that for one moment I sure felt like stabbing Salieri to his death for snatching Mozart of his life so young and thus depriving the devotees of Mozart's music of some precious valuable masterpieces that could have been created had Mozart lived long. Seriously, jealousy is like poison. It eats you from inside and makes you vulnerable to commit a crime, some times, against someone you might worship or look up to. It tears relationship apart and breaks friendship. I remember I read a news sometime back when an angry elder brother seething with envy at his younger brother's success killed him mercilessly. If you have seen London Dreams, you might like to know that London Dreams starring Salmon Khan and Ajay Devgan was actually based on the theme of Amadeus, at least partially. The climax is different though. Now to the recipe, a traditional Bengali breakfast comprises cholar dal, luchi and begun bhaja. I recall when we were young, luchi and cholar dal or luchi and alur dum were sacrosanct in the breakfast menu. Each of us, me, didi and dada would at least have 10-12 luchis at one go. Curiously, even after such heavy breakfasts, there was space enough in our tummies for a sumptuous afternoon meal and yet, we were as thin as sticks. In fact, 'hanger' is the appropriate term to describe my shape in those days. 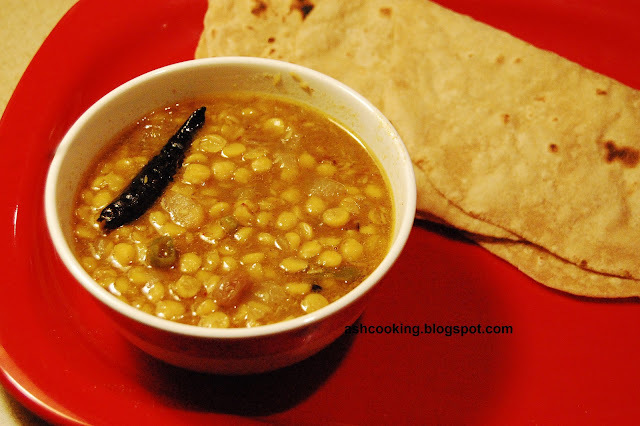 1) Soak the cholar dal overnight for 5-6 hours before cooking. If you plan to cook it at night, then soak the dal in the morning or in the afternoon. 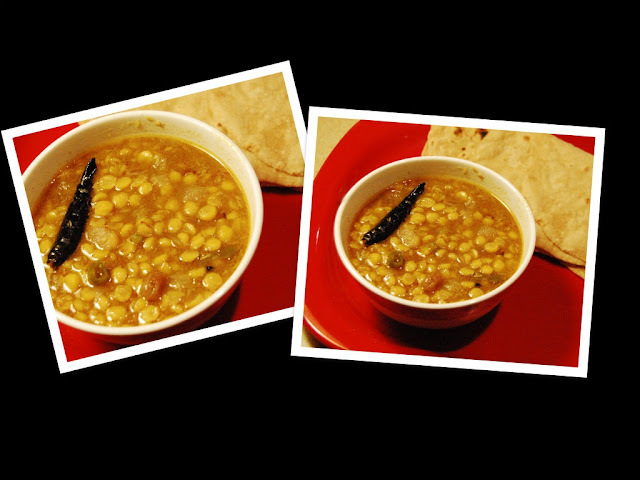 2) In a pressure cooker, take the dal in along with water, butter, turmeric powder and red chilli powder. Give a gentle stir and put the lid into place. Now on medium heat, let the steam build up inside and just the moment the pressure cooker lets out a hiss before a full-blown whistle, turn the heat off. Let the dal be cooked with the steam that has built up. When the steam completely evaporates, open the pressure cooker and check the dal. It should be tender in your mouth but the grains will remain separate. 3) Heat oil in a wok and as oil turns hot, toss in the cumin seeds; and wait till they begin to sputter. 4) Add onion and shallow fry. Add grated coconut and raisins. Stir around and cook till coconut becomes golden brown in color. 5) Add ginger paste, cumin powder and green chillies. Sauté till the spices blend into a nice flavour. 6) Now pour the cooked dal into the wok. Give a stir. Season with salt and sugar. Cook covered for few minutes till the water content reduces a bit. When the dal appears to have reached the right consistency, sprinkle garam masala powder on top and drizzle ghee. Stir around to mix in. 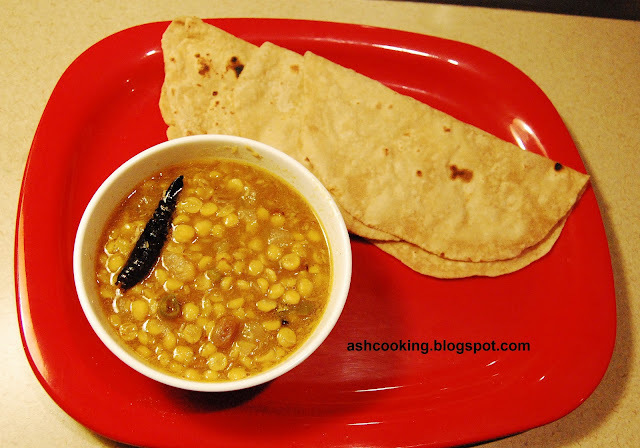 7) Serve hot with roti, chapatis, parathas or rice.